Your whole family will love this Gluten-Free Hawaiian Haystacks recipe with a creamy chicken sauce made from scratch – no canned cream of chicken soup. I grew up in Utah and everyone I know regularly eats Hawaiian Haystacks. I figured everyone in America eats them regularly. But I’ve talked to people outside of Utah and no one has heard of them. It’s mind-boggling. I mean, seriously. These are most people I know main weeknight go-to recipe. However, most people make them with a can of cream of chicken soup and evaporated milk (gross) and put those Chinese noodles on top. The Chinese noodles are actually really good on those and I miss them a little, but I like nuts almost as much. Why are they called Gluten-Free Hawaiian Haystacks? I’m pretty sure it’s because they have pineapple. Other than that, I’m pretty sure they aren’t Hawaiian at all. I like my Gluten-Free Hawaiian Haystacks with a few non-traditional toppings. For added color and flavor, I sautée zucchini and bell pepper for another hot topping that is quick and super easy to make along with the suggested sides list. Some of my favorite toppings are baked red peppers and onions, all caramelized and yummy. We make this Gluten-Free Hawaiian Haystacks recipe like once a week in our family and now that my son is eating dairy free, we tried making it dairy free and it’s super easy. Just use a dairy free fat, like avocado oil and use a can of Natural Value coconut milk for the milk. I was worried it would taste coconut-y but it totally doesn’t. It doesn’t taste quite the same as regular milk or cream but it tastes good and three of my children like it (my other daughter never eats the regular version because she doesn’t like chicken at all). When I told them later it was made from coconut milk they didn’t even care. I’m glad because I was wondering what we were going to eat if we couldn’t eat Hawaiian Haystacks. 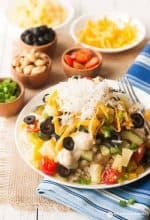 This healthy Hawaiian haystacks recipe can easily be made gluten-free by using a gluten-free flour to thicken the white sauce and that’s really the only change you would have to make. I used to make the chicken in the Instant Pot and then just add it to the sauce, but I found it to be pretty tasteless and the texture didn’t seem right, so I don’t recommend that. My family had these a lot when I was growing up and I love this healthy Hawaiian haystacks recipe! It is very versatile and is a good basic recipe and then everyone can make it their own according to their taste. Now my children love this recipe because everyone can do the toppings they like and I think it’s a good way to eat a wide variety of foods. Coming from a large family, we have A LOT of parties and this is a good food to make for a lot of people. Usually, one person makes the chicken and sauce (when I make it, I usually serve the chicken and sauce separate so people can choose if they want any chicken at all or tons of chicken) and then the person in charge assigns each person to bring a topping. 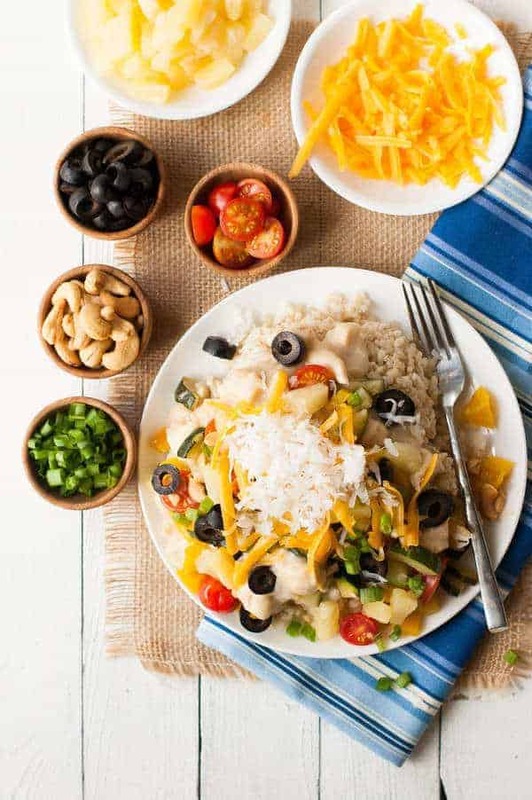 So easy and so customizable and picky children can just eat plain rice with little piles of their favorite ingredients, like grated cheese, tomatoes and nuts. What are your favorite toppings you would put on your haystack? I made these haystacks with a creamy chicken sauce made from scratch. No canned cream of chicken soup. For added color and flavor I sautéed zucchini and bell pepper for another hot topping that is quick and super easy to make along with the suggested sides list. Heat the butter in a large sauté pan with high sides on medium/high heat. Add the onion and sauté for 1 minute. Add the chicken and sauté until the onion is translucent and chicken is cooked through. Add the flour, salt, pepper, garlic powder, and ground mustard to the chicken and stir until fully absorbed into the butter. Continue to cook the chicken/flour mixture for another 30 seconds so that the starch in the flour can cook out. Pour the can of chicken broth into the pan and cook, stirring constantly until thickened. Pour in the milk and bring to a boil, stirring until thickened. Check seasonings and add more salt, if desired. Heat the olive oil in a sauté pan over medium/high heat. Add the zucchini and peppers and sauté until just tender. Add salt and pepper to taste. 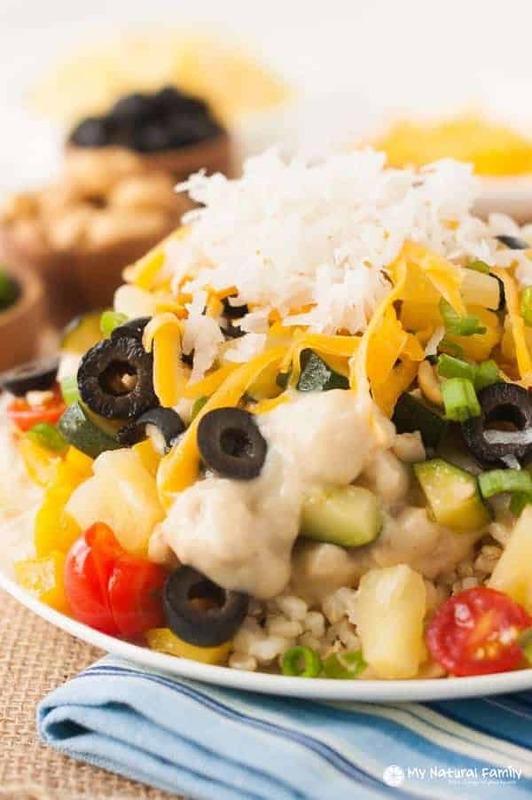 Top a serving of rice with creamy chicken sauce, sautéed vegetables, and desired toppings. These haystacks are very similar to a dish I grew up eating. I’ll have to try these sometime. I am diabetic and can’t have the rice, any suggestions on a different way to serve? Quinoa or cauliflower rice should work well. I’d never heard of Hawaiian Haystacks before today but they look really good! I’d like to try making your chicken sauce! Thanks for sharing them with us at #FoodieFriDIY! I’ve never had a haystack before but it looks and sounds fantastic! Have a great day! I love Hawaiian Haystacks, but don’t think I’ve ever seen such a variety of fruit and veggies on it. Thanks for sharing on Weekend Bites! I’ve never seen zucchini as a topping for Haystacks! My family loves haystacks and we love to see what other families top their version with. Thanks for sharing. You’re welcome! Please let us know how you like the zucchini.